The interesting thing (to me) about the Wagga Wagga byelection is that the vox pop on the ABC over the weekend had people saying that because of the leadership spill, they were disaffected with both Liberal and Labor. As far as I was concerned, this was all about the Liberals. Labour have remained pretty much blameless during the whole process. I'm predicting a big swing towards the Greens and Independents in the coming election, which I still think will be called before the end of the year. ps. You don't call Wagga Wagga Wagga. The Greens were also big losers in the by-election with their primary vote almost halved. We are more likely to see votes leaking from LNP to right wing minorities (like One Nation). If Scott Morrison has any brains then he will avoid an early election like the plague. The more time that elapses since the leadership spill the better for the Libs (especially if Morrison can maintain some stability during the year). Of course, if the government loses their majority then a no confidence motion is always possible. I suspect that such opportunism would not help the Labor party - especially if a double dissolution is the result. Last edited by psionl0; 9th September 2018 at 08:02 PM. I do. It gets up the noses of the locals, and as I said earlier, I don’t have much regard for the place. You can call Walla Walla Walla though. Getting back to Morrison and his Pentecostal faith, I can imagine him getting all lathered up and treating us to an exhibition of "speaking in tongues", on the floor of parliament. That would be a hoot. Who is this old goat?? Senator Wacka? John Williams, Senator for NSW. Last edited by arthwollipot; 10th September 2018 at 07:44 PM. He's a National Party senator in NSW. I got the link from his Twitter page, which does appear to be borked. He's saying that... wait, the Guardian explains it better. Just further on what Wacka told Sky, the problem for the NSW Liberals is this. There are two winnable spots on the NSW Senate ticket - which are guaranteed wins. Jim Molan is the only Liberal NSW senator who is up for election at the next poll. Under the agreement between the two parties, the Nationals are supposed to have spot number two. With Andrew Bragg withdrawing from the Wentworth race to ‘focus on Senate opportunities’ - which is what he told the Daily Telegraph yesterday, that means Jim Molan has to be punted, in order for Bragg to get a winnable Liberal spot on the ticket. 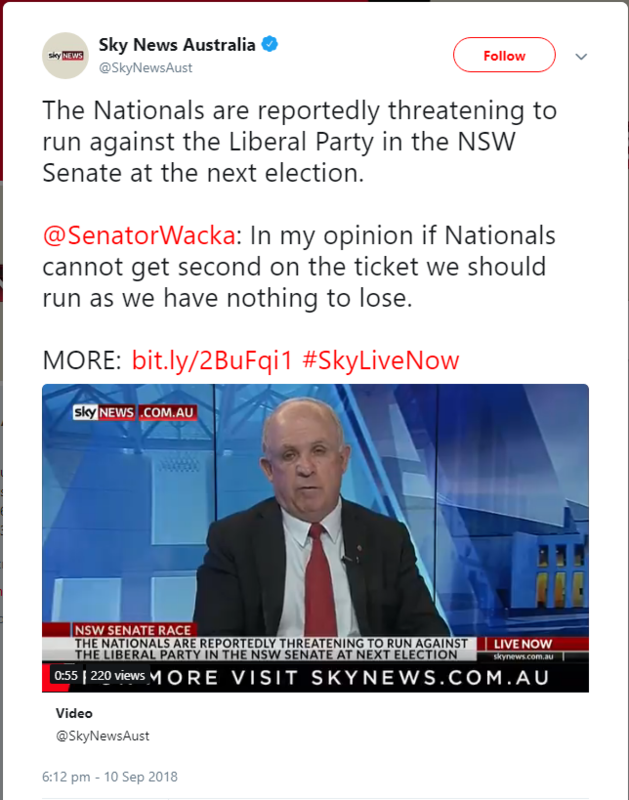 The only way Molan’s Senate career lives on, is if the Liberals take the top two spots - relegating the Nationals to three and below. The Nats, already worried about representation in NSW, are not overly happy with that. Hence Wacka’s call to arms on Sky a few minutes ago. It would be great if the Nationals had a separate line for themselves for the Senate. That way they need to get enough people to vote for them for their members to get elected. Dutton and Quaedvlieg the former Border Force boss are at loggerheads. Dutton claiming his evidence in the senate inquiry is fabricated and is doubting Quaedvlieg's mental health. And now he's accusing him of grooming underage girls. Is there no depth to which Dutton will not sink? Nope. He's a Qld copper. Expect him to lower the bar then crawl under it. Dutton is fighting for his political life. Expect more abuse and accusations. He has already described Quaedvlieg as Labor's Godwin Grech. Dutton doesn’t matter anymore. Morrison would be happy if he self-immolated. All Morrison craves is the support of News Ltd and Sydney shock jocks. This has been enough to ensure the election of Tory idiots in past years. You would expect the % of the voters who will vote for the Government in the by-election to be far lower than in the previous election. After all I am sure many people would have voted for the PM, rather than the Liberals. Now the Liberals have lost that vote. But will it be enough for someone else to take the seat? According to the private polling, the Liberal’s primary vote has plummeted to 39 per cent, from 62 per cent when Mr Turnbull was the member. With the Libs barely hanging on by a fingernail and scrambling desperately for actual policies, that makes each and every backbencher "important" to keep on board. So what does Abbott do? Stirs the pot. I do hope, if the Libs get trounced next time, and it looks like they will be, Abbott never gets preselection again. Tony Abbott has reignited his push to scrap subsidies for renewable energy, taking on the new energy minister, Angus Taylor, at his first meeting of the government’s backbench energy and environment committee on Tuesday. Last edited by Norman Alexander; 11th September 2018 at 04:34 PM. Jason Ball, a name that should be known to us Australian skeptics, is running for the Greens in the previously-safe Liberal seat of Higgins. And it actually looks like he might have a shot. The Wentworth by-election will be on October 20. Not long to wait, and I suspect a less than optimum strategy. My betting is that preference deals will see an independent elected. Given the electorate it will no doubt be a right leaning independent, meaning no change to the balance of power. It would seem Morrison has caught foot in mouth disease. Labor has demanded an explanation from the Prime Minister, after he authorised and tweeted a feedlot operator's suggestion that drought could be considered a "necessary evil" that helps "cut out the bottom 10 per cent" of farmers. Last edited by Thor 2; 12th September 2018 at 01:51 PM. Folks who follow the goings on in Canberra will know that last night was the midwinter (in early spring) ball that the press gallery puts on every year to raise big bucks for charity. Many readers will also know there is controversy about whether this event is on or off the record. The organisers have decreed the ball is an off-the-record event. But I’ve long argued that an event where politicians give speeches in front of hundreds of people, most of whom are not bound by an off-the-record convention, cannot be off the record. I’ve raised this with the organisers of the event, who, for now at least, want the event to remain off the record. I told the organisers this year I would not accept this ruling, because it is practically unenforceable and professionally indefensible. Off the record is a convention that requires consent between journalist and source. To cut a long story short, I don’t consent. I indicated to them I would be reporting anything that was newsworthy. Not massively. Scott Morrison and Bill Shorten both delivered speeches that were lighthearted and, in Shorten’s case, almost entirely self-deprecating. Morrison obviously had the tougher job. Shorten has done this event every year he’s been opposition leader and is now well practised. Obviously, it was Morrison’s first outing, and the weight of recent events was very much in the room. The new prime minister got through about 70% of the speech before being heckled. A woman shouted “Bring back Malcolm”. The intervention literally stopped Morrison at the podium, and the room as a whole. I think it’s fair to say there was a collective intake of breath, because it wasn’t clear who had provided the free feedback, and it goes without saying that the government has endured a torrid month. Morrison was obviously taken aback, but he gathered himself quickly and kept going. Fortunately for the prime minister, it turns out the heckler was the Greens senator Sarah Hanson-Young, rather than a disgruntled colleague who had downed one wine too many. I gather the interjection was intended to be lighthearted, and she apologised. The ball, in times of political drama, has seen worse. But it was certainly a moment. How do you pronounce "Quaedvlieg" anyway? Surprise surprise, the Liberal Party has preselected a rich white man to run for the seat of Wentworth. They did that last time. Look where it got them...and him! Crafty choice though. The Jewish vote is strong in Wentworth. A lot of younger moderate Jews would likely have voted Labor or Independent. Sharma will now get the majority of their votes. Murdoch and Stokes can just **** off. You seem...somewhat peeved at our fourth estate magnates. Pray tell why? A delegation from Saudi Arabia in Question Time today has 25% female representation. The Liberal National Coalition has 18%. Okay, thanks. I was wondering about the rage. Oh, bloody fantastic. We are a world laughing stock when it comes to carbon emissions, now we are shamed by Saudi Arabia when it comes to female participation in the political process. ******* Liberal scum. It's not a good look, is it? To be fair, the Saudi delegation consisted of eight people. In breaking news, the Senate committee has resolved that Peter Dutton misled parliament about his relationship to the employer of an au pair. Expect a No Confidence motion soon. I don’t think this will go anywhere. His stake in a trust earning government funding via child care centres will do him in. The indication is that a No Confidence motion will be put to Parliament tomorrow morning. Predictably, Abetz and McDonald have denounced the whole thing as a "witch-hunt". Gee, I wonder where I've heard that before. Complete disrepect for the intelligence of the Australian people. That and the behaviour shows an arrogant sense of entitlement. Last edited by Sideroxylon; 19th September 2018 at 04:10 AM.